“Hard trainers need adequate electrolytes for optimal function. 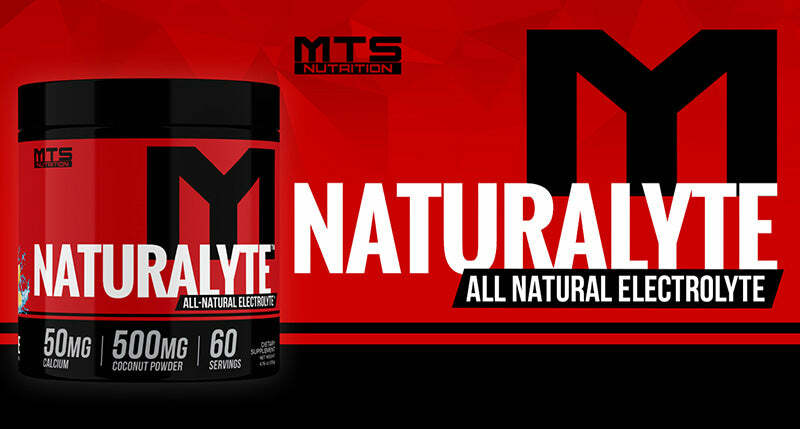 NaturaLyte is designed to be used throughout the day and during training to ensure optimal performance. Other electrolyte formulas use the peasant of all sodiums, table salt, for their sodium source. NaturaLyte uses All-Natural Sea Salt as the exclusive sodium source. Add in Calcium, Potassium, Magnesium and Coconut Water Powder with an all natural profile and you have the perfect electrolyte drink mix. NaturaLyte is an all-natural electrolyte formula that can be used during training or simply to enhance your water intake throughout the day. Feel free to mix it with your favorite pre-workout or intra-workout. NaturaLyte contains calcium, potassium, magnesium, and coconut water powder to ensure that you are properly hydrated with the perfect electrolyte balance. Each scoop also provides sodium that is exclusively procured from sea salt. Unlike other electrolyte powders that use cheap and harsh sodium sources, NaturaLyte’s sea salt is obtained by evaporating seawater. It contains essential minerals and nutrients that are removed from ordinary table salt during the refining process. NaturaLyte includes nutrient-dense sea salt, not the stripped down form of sodium typically included in supplements. While salt is often demonized, research shows that consumption of sea salt protects against hypertension and kidney damage as well as support immune system function. Immune System: Sea salt and its many vitamins and minerals can prevent a deficiency common to athletes and those who train, enhancing the immune system and preventing sickness. Alkalinizing: Since it is not heated or chemically treated like stripped-down forms of sodium, sea salt can enhance alkalinity in the body enhancing nutrient absorption and enhancing health. Digestion: Sea salt can aid in the production of digestive juices, enhancing digestion and preventing stomach issues. Muscle Cramps and Spasms: Containing potassium and other minerals, sea salt can prevent muscle cramps and spasms. Blood Sugar: Sea Salt can help maintain healthy blood sugar levels. Dehydration: The minerals in sea salt help to prevent electrolyte imbalances from perspiration and water intake. The most abundant mineral/electrolyte in the body, calcium is primarily known for its importance in regards to bone and teeth health. But that only begins to scratch the surface of this minerals effects in the body. Calcium is also essential for muscle contraction, transmission of nerve impulses, and even blood clotting. If you’re deficient in calcium, your body will leech the required calcium from your bones, setting you on the path for brittle bones and osteoporosis. Providing the counterpunch to sodium is potassium, the electrolyte that forms the other half of the electrical pump responsible for regulating electrolyte balance and neurotransmission. Much like sodium, potassium is lost is vast quantities during intense exercise, setting you up for increased fatigue and cramping. Consuming sufficient potassium ensures sustained performance, mental clarity, and carbohydrate metabolism. The fourth most abundant mineral in the human body, magnesium plays a role in over 300 different processes in the body. Included in these 300+ reactions is the synthesis of DNA and RNA! In terms of athletic performance, magnesium maintains heart rate, stabilizes blood sugar, and regulates muscle function. It also supports bone and teeth formation and bolsters the immune system, further highlighting its importance to your health and well-being. NaturaLyte is the perfect NATURAL electrolyte mix for you! It can be used as a flavor enhancer for your water or as an addition to your normal preworkout or intraworkout drink. 1. Lee B-H, Yang A-R, Kim MY, McCurdy S, Boisvert WA. Natural sea salt consumption confers protection against hypertension and kidney damage in Dahl salt-sensitive rats. Food & Nutrition Research. 2017;61(1):1264713. doi:10.1080/16546628.2017.1264713. 4. Gröber U, Schmidt J, Kisters K. Magnesium in Prevention and Therapy. Nutrients. 2015;7(9):8199-8226. doi:10.3390/nu7095388. 5. Alleyne T, Roache S, Thomas C, Shirley A. The control of hypertension by use of coconut water and mauby: two tropical food drinks. West Indian Med J. 2005;54(1):3-8.